Sprayskirt, PFD and ... shorts, sunscreen and a big hat? It's best to dress for the sea temperature, not the air temperature. Shorts and a T-shirt are fine if you would cheerfully dive in and swim. 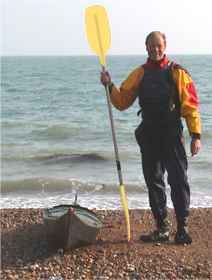 Most sea kayaking takes place on water which never goes above a refreshing 16 degrees centigrade. Read about the physical effects of sudden immersion in cool water at Cold Shock, Swim Failure & Hypothermia. The wind on open water is typically about twice as strong as it is on land. As a result, the apparent temperature is often 10 degrees cooler than on the parking lot, so take a waterproof jacket. On the other hand, you get nearly double the amount of ultraviolet exposure because the sunshine gets you once on the way down, and again when it bounces up from the water. You may get sunburn underneath your chin and under your eyebrow ridge... ouch. We can't resist a literary quotation from Richard Hughes's classic novel of childhood, A High Wind in Jamaica (1929): "While on land a shady hat protects you from the sun, at sea nothing can protect you from that second sun which is mirrored upwards from the water, strikes under all defences and burns the unseasoned skin from all your undersides. Poor John! His throat and chin were a blistered red." If you're not used to being outdoors for long periods, be aware that you can get sunburnt even if there's a thin layer of cloud, and you can get burnt through thin clothing. Sporting good stores often stock thin shirts made of fabrics like Solarweave and SolarDry that are designed to protect against UV light. They're usually polyester-cotton. Clothing that complies with the Australian and New Zealand standard AS/NZS 4399 or the American standard ASTM-D6603-USA give sun protection equivalent to SPF / UPF Factor 50 sunscreen lotion. European standard BSEN 13758-2 is equivalent to Factor 40 sunscreen. A good case can be made for applying sunscreen lotion anytime you go kayaking in the warmer months. If you're not sure which to choose we suggest starting with a high "solar protection factor" such as Factor 50. A Factor 50 transparent lipstick is a good buy. Children and people with fair skin are particularly at risk so Factor 18 probably won't be enough. "[During a November cold snap in Greenland] it would be impossible to use a harpoon as ice forms on everything and would freeze the throw-stick to the shaft... [I] have to wash the paddle in the water to stop ice forming too thickly on it". Any time of year you will probably be wearing a sprayskirt and PFD, both of which give a lot of thermal insulation; and a good waterproof jacket which will reduce heat loss from wind and evaporation. You may choose to wear a kayaking helmet which keeps your head warm. What else? There's no guarantee you'll stay dry or in your kayak. You may have an accidental swim, your kayak may leak, your sprayskirt may pop off or start to leak badly through a seam. In cool climates, we recommend dressing the same whether you are surfing (and will inevitably get soaking wet) or touring (hoping to stay dry, but you never know). That means a swimsuit; a wetsuit, sprayskirt, waterproof jacket, PFD and wetsuit boots. You may wear a thin synthetic base layer shirt under your wetsuit. You may wear a synthetic fleece pullover over the wetsuit but under your jacket, and a hat, scarf and mitts. That way you will avoid cold shock, swim failure & hypothermia and will stay reasonably comfortable. For comfort in really cold conditions it hard to beat a drysuit worn over base layer garments and a mid-layer of thick synthetic fleece. We like to know what we're spending our money on. Also, you can easily make some of your own kayak clothing if you want. It is easy to make warm garments from synthetic fleece. You can't really make your own waterproof clothing at home except with wetsuit material. Other waterproof fabrics are available from specialist suppliers, and they look as good as the fabrics used by manufacturers of kayak clothing but in our experience they are often of much lower quality. A few months of abrasion and sunlight, and they start to leak. A few more months and the waterproof coating starts to peel off. Also, you probably don't have access to equipment for hot-air taping of the seams to ensure they're perfectly waterproof. Wool. Especially if it still has its natural oil, wool retains most of its insulation value when wet but like other natural fibers it is very heavy when wet, takes a long time to dry out and will rot it if stays salty for long. Then again, in his book Sea Kayaking (Greystone Books, 2004) the expedition kayaker John Dowd recounts switching back to wool underwear and pullover after trying it instead of synthetic fleece during a six-month winter trip to Patagonia because he found wool was warmer when damp. He doesn't say what he was wearing over it but on the previous page he recommends Gore-Tex drysuits. He's not the only modern-day voyager in small boats to give up synthetic thermal clothing. Cold water professionals such as Faroese fishermen use wool underwear. Tim Severin and crew sailed their 36-foot curragh Brendan from Ireland to Newfoundland via the Faroes and Iceland. This open boat had only 16 inches of freeboard, not much more than a kayak. "As the weather turned colder we replaced our clothes of artificial fiber in favor of old-fashioned woollen clothes, reeking of natural wool oil. We may have looked and smelled unlovely but [kept warm in]... our oiled wool sweaters, thigh-length wool sea boot socks and cowl-like woollen helmets". From The Brendan Voyage by Tim Severin (Hutchinson, 1978). We remember reading that the crew of a Viking ship replica sailing in the north Atlantic (was it the 100-foot Havhingsten Fra Glendalough in 2008?) made the same discovery. Cotton. Definitely a bad idea for cool-climate sea kayaking, even for hats and underwear. Back country ski experts say "cotton kills". When it gets wet it has no insulation value, cools you by evaporation and takes a very long time to dry. A legendary cloth, cotton Ventile, has been used since World War II to make survival suits for RAF and more recently other NATO fighter pilots who might have to parachute into the sea. It is made from the finest long-staple cotton and is very closely woven. When it gets wet the fibers swell, close up and keep the wearer dry for a surprisingly long time. www.ventile.co.uk. Ventile garments are very expensive but popular with Arctic explorers and naturalists because they are comfortable, breathable and, unlike synthetics, do not rustle. They are particularly good for Arctic winter conditions. As far as we know Ventile is not suitable for kayaking clothing because it will eventually get soaked and is then heavy, very cold and allows water to seep through. Most waterproof fabrics used in kayak clothing and equipment consist of a nylon or polyester woven fabric with a thin waterproof coating. Tougher fabrics are laminates with outer layers of nylon or polyester fabric and a waterproof membrane sandwiched between them. This photo is of three good fabrics, slightly smaller than life-size. The top row shows the outside of (1) PVC coating (2) Gore-Tex laminate (3) neoprene coating. The bottom row shows the inside of the same garments with their taped seams. Neoprene is one of the most durable waterproof coatings, and PVC is usually good too. Polyurethane can be an excellent coating but cheaper blends with a very short lifespan are popular with manufacturers of cheap and counterfeit clothing. Coated fabrics can be completely impermeable to both water and water vapor, or breathable so that water stays outside but water vapor from the body can pass through without condensing. All Kayarchy contributors like to use breathable garments for walking and climbing but many prefer non-breathable ones for kayaking. Non-breathable fabrics are fine for kayak day-trips in a cool climate. Their coatings resist abrasion, salt, oil and ultraviolet light so they last a long time in real sea kayaking conditions. True, water vapor from your body will condense on the inside so that your clothing gets slightly damp after a while. You paddle around in your own little sauna. On a multi-day expedition where you can't dry your clothes at night, this can get quite character-building. Breathable fabrics (also known as moisture vapor transmissible or MVT) keep you drier but not necessarily warmer. Survival bags are intended to reduce a casualty's heat loss from evaporation in cold, windy conditions and they are made from plain ordinary polyethylene sheet. That is not just because it's cheap. See Hypothermia. Breathable fabrics usually consist of a nylon or polyester cloth with a micro-porous membrane laminated onto it. For example, microporous polyurethane as at Thermal Stretch Materials. There are dozens of breathable fabrics, from those which are afraid to admit what they're made of and have the life expectancy of a candle flame on a windy day, up to Gore-Tex which is expensive. Breathable fabrics allow water vapor to pass through instead of condensing, so they keep you drier. However they permit evaporative cooling. Try covering a cup of steaming hot water with breathable fabric. You will be able to see the steam go straight through it, taking the heat with it. You could say that breathability is powered by the wearer's body heat. Synthetic breathable fabrics are harmed by oil, whether from industrial pollution, boat exhausts or the wearer's body, sun cream or lunch. We're not going to get involved in the "how long do breathable garments last" debate, except to suggest you check the terms and length of the warranty. Wetsuits are made from a soft neoprene foam. Neoprene is a synthetic rubber. Although not quite as flexible as natural rubber, it is almost unaffected by water, salt, ultraviolet light, heat and oil, which is why it is used for rubber auto components. Wetsuits for divers and cavers are made of a dense, hard-wearing foam created by injecting nitrogen bubbles into liquid neoprene. Rubatex is often said to make the best neoprene sheet of this sort. Their product is tough, durable and resists compression. It would be OK for a kayaker's farmer John/Jane wetsuit but is seldom used for surface sports. Wetsuits for surface sports are made from a more flexible and squashy neoprene foam which is chemically expanded. The result is a comfortable wetsuit which is easy to put on. Material quality is highly variable. Bad material is inflexible and the nylon backing soon peels off. Reputable manufacturers of neoprene sheet include Yamamoto and Heiwa. We've also heard of Sheico (world's biggest), Misuzu and Yaco without knowing much about their products. It is sometimes said that the warmest and most flexible material for surface sports is not the usual petrochemical product but one made by Yamamoto out of limestone. NRS of Idaho now also uses a limestone-based foam under the brand name Terraprene for its kayak clothing. Is that still neoprene, technically? Solid neoprene is exceptionally resistant to cuts and abrasion, which is why it is used as a coating for whitewater rafts. 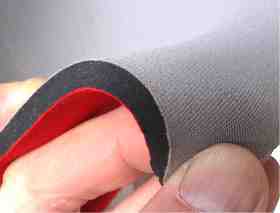 Unprotected neoprene foam can easily be torn with a finger-nail or abraded by a rough surface so wetsuit material usually has a layer of thin nylon laminated onto both sides ("double-lined" or N2S). A farmer John should be made of double-lined material for increased durability. The outer layer of nylon will get wet, but you will be wearing the wetsuit under a waterproof jacket so this will not cool you by evaporation. Outer garments such as tuiliqs, hats and pogie mitts are warmer if they are made of neoprene with a layer of nylon only on the inside ("single-lined" or N1S). Water just runs off the outside and they are more stretchy and flexible. See Thermal Stretch Materials. The outside of single-lined material can be smooth, which sheds water best, or be embossed with a texture such as sharkskin to help resist cuts and abrasion. 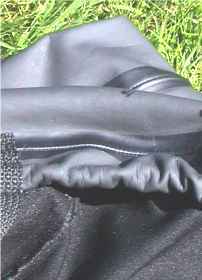 It is easy to make or repair neoprene garments with waterproof seams. Two neoprene edges can easily be welded together with Black Witch neoprene cement, which is available in small tubes from most kayaking, windsurfing and dive stores, or glued with Aquaseal or any polyurethane glue. The nylon linings must be also be sewn together using polyester thread, preferably with stitches that do not go right through the neoprene (blind stitching). Good wetsuit manufacturers use hot-air taping, but some of the best manufacturers still use just glue and blind stitching. Wetsuit material is available in thicknesses from 1 mm to 12 mm. The thickness stated by most manufacturers is just the neoprene foam, but some state the total thickness of the material, in other words the foam plus the nylon lining. 1 mm, 1.5 mm and 2 mm single-lined are good for making summer tuiliqs and stretchy hoods. 3 mm single-lined is good for winter tuiliqs. 3 mm double-lined is good for a farmer John wetsuit or sprayskirt for summer, 4 mm is good for year-round sprayskirts, and 4 mm or 5 mm double-lined for an all-year wetsuit. 6 mm double-lined for a suit for winter surfing. It isn't really worth making your own wetsuit because you will probably have a failure or two when you first try, and you can easily buy a good one at a reasonable price. It is fun to make other garments such as tuiliqs and pogies. A few suppliers will sell you a single sheet of neoprene. See Retail Outlets. 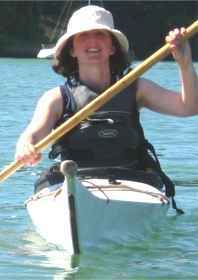 Thermal stretch fabric is great for outer garments for kayaking. It has a smooth, rubbery outer layer so water runs off it rather than soaking in and cooling you by evaporation, and an inner layer of foam, fleece or woven fabric for warmth. It can be used to make stretchy, tight-fitting hoods and suits or baggier outer garments such as jackets or tuiliqs. The original thermal stretch fabric was thin single-lined wetsuit material. In other words a 1 to 2 mm layer of neoprene foam with a nylon lining on the inside and a smooth outside to shed water. Such garments are still available, and are still pretty good except that the outer skin of ordinary neoprene sheet is vulnerable to abrasion and can easily be nicked with a fingernail. Some manufacturers now produce single-lined neoprene sheet with a noticeably tougher outer skin for use in triathlon and open-water swimming suits. There is also a new approach to thermal stretch which may not be as warm as neoprene but makes garments which are stretchier, fold up a lot smaller, are more durable and may be breathable. Generically it is called thermal stretch, fuzzy rubber or PUL (polyurethane laminated). Brand names include Aqua Shell from Malden Mill's Polartec range, Helly Hansen's Impertech fabric and Reed Chillcheater's Aquatherm. See Retail Outlets. These fabrics usually have an outer layer of smooth polyurethane and an inner layer of fleece or woven fabric. They were developed to replace hospital supplies such as waterproof bed-sheets, diapers and surgical gowns with products which can be sterilized in an autoclave, tumble-dried and re-used. PUL fabrics typically consist of a membrane of smooth stretchy polyurethane, with a knitted polyester fabric laminated to one or both sides. There are about a thousand blends of polyurethane. The best are very durable. Some can be machine-washed at 90°F, a few can apparently be autoclaved at 275°F, and some are breathable. Breathable PUL is either microporous, so that water vapor passes through tiny holes rather than condensing on the inner surface of the fabric, or hydrophilic, so that moisture enters the structure of the polyurethane film and wicks through to the outside. In both cases, the fabric breathes because moisture is driven through it by heat and humidity from the wearer's body. The membrane can be laminated onto a woven or knitted fabric, natural or synthetic, by printing a pattern of adhesive dots onto about 10% of the surface area of the membrane and then bringing it into contact with the fabric. PUL is excellent for baggy garments such as waterproof jackets and pants; and for hoods and gloves. It is great for children's kayak clothing. It can also be used to make figure-hugging garments similar to farmer John and steamer wetsuits but ... slinkier. A PUL garment has about the same insulation as 1 to 2 mm neoprene. If a cool-climate kayaker wears a wetsuit, it is probably at least 3 mm thick even in summer. Figure-hugging thermal stretch suits are not intended to be worn as main garments by anybody who expects to spend a long time in the sea in a cool climate, but apparently they are going down really well in Australia. A kayaker can easily add a little extra insulation to the basic wetsuit-and-jacket outfit by wearing a base layer shirt under the wetsuit. This is the synthetic equivalent of a cotton T-shirt. Pants resembling a thick pair of pantyhose are also available in base-layer fabric. They are popular with hikers and climbers. Base layer garments are made of thin, stretchy, knitted synthetic material, usually polypropylene because it repels water and is comfortable next to the skin. Some baselayer garments have a wicking layer of treated polyester next to the skin, to absorb moisture and transport it away from the body so you feel dry. Unlike cotton and nylon, polypropylene provides good insulation even if wet, holds very little water when dunked, doesn't go saggy when wet, and dries very quickly after washing. Synthetic base layer garments quickly get smelly unless some antibacterial is incorporated by the manufacturer. Click here for more techy information. Wool underwear is another possibility which some feel is better, especially in really cold conditions. See above. These do the same thing as base-layer garments but are thicker. For kayaking, synthetic fleece fabrics are better than natural fiber because they have good insulating value when wet, are easy to wash, and dry quickly. They are usually made of polypropylene. Ordinary fleece is the synthetic equivalent of knitted wool fabric. A fleece pullover worn over a wetsuit and under a waterproof jacket can make life pleasant on a cold day. Thick fleece such as Helly Hansen's ProPile is the synthetic version of sheepskin. Fiber-pile garments may be furry on the inside, with a woven surface, either incorporating a windproof membrane or with an outer shell of Pertex. They may be bulky enough to provide effective insulation if you go for an accidental winter swim wearing a membrane drysuit. On land, thick fleece garments with a Pertex shell are popular with outdoor professionals who work in cold damp areas. They are used as an alternative to a wetsuit by some sea kayakers, especially those who go for a trip in the confident expectation of staying upright and fairly dry. They put on "base layer" shirt and pants made of stretchy polypropylene, plus for winter a pair of thick fleece salopettes (bib pants with a high waist and straps over the shoulders) and / or a thick fleece pullover, a sprayskirt, a good waterproof jacket, and maybe a pair of high-waist waterproof pants as well. This combination of clothing is very comfortable in the kayak and on shore, but if you go for an accidental swim in cold water it does not give much protection against cold shock. The fleece absorbs and holds a lot of water, and the waterproof pants do little to stop the escape of warm water, which is constantly replaced by cold.